Pet-A-Bulls will be closed through 3/1 for family leave. We apologize for any inconvenience and appreciate your patience. Be assured that we will resume our regular 24/7 program schedule on 3/2. Hi, my name's Porgi cause I'm a 'Shorgi' from New Orgi (originally) = WOO HOO !!! 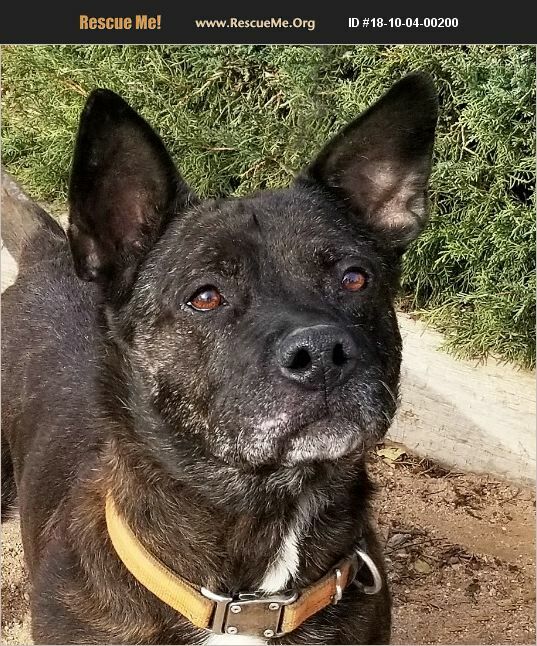 I'm an 8 year YOUNG spayed female lovingly referred to as a 'SHORGI' (a hysterically funny Corgi / Dutch Shepherd blend) who's said to be a VERY SPECIAL find 'cause I'm the FRIENDLIEST lil SNAUSAGE in town! I'm a sweet GENTLE clown who loves to snuggle and the consummate house dog who knows how to behave like a Lady, both indoors AND out because I'm accustomed to living in an indoor home and certainly willing to do whatever it takes to retain that privilege ! I have the absolute softest fur and a stable, even temperament: CALM, highly INTELLIGENT, easy to train, AFFECTIONATE, extremely GENTLE and very WELL BEHAVED indoors knowing that's the place to be kicked back. I'm a SWEET girl who is super socialized, housebroken, crate trained and even sits for treats and/or attention instantly. I love to lay at your feet and play with my bone(s) or favorite toys and especially enjoy car rides where I sit nicely to take in the scenery! I'm certainly NOATHLETE but I promise to follow wherever YOU roam and always mind my manners in ANY situation. I make sure to announce the arrival of any strangers but I'm especially good with people ! I have a heart of gold so I'm GREAT with other dogs and known to be beyond FABULOUS with children of ALL ages! I'm SUPEREASY on a leash, already know my 'sit, wait and load up' commands, learn really quickly and looooove to please. My rescue friends say I'm the PERFECT canine ambassador, a GREAT COMPANION and friend because I have a heart as big as all outdoors. I'm just happy they're so pleased with me, but then I'm a HAPPY kinda gal anyway ~ BRIGHT and CHEERFUL is what I'm all about! I'm looking for a special person(s) or a family of my own so I can stick by your side through thick and thin 'cause I'm the most LOYAL friend you'll ever encounter! Darling POCKET Sausage lookin to Devote HER Lifetime to LOVE !!! Why wait??? Simply call Mare at (505)316-2089 for a private 'By Appointment Only' showing at our 'Adoptions in the Park' !!! Or contact us via our petabulls.com/adopt website. PLEASE include YOUR phone number on all inquiries as we are RARELY around the computer these days :) Open 10 am to 7 pm Wens thru Mon. Closed Tuesdays. OR come meet the PACK at our Wild Pet Food Plus Pet Adoption event Saturday, March 16th, from 12 noon to 5pm - 3301 Menaul Blvd NE Suite 10, Albuquerque, NM 87107. We hope to see YOU there !! !